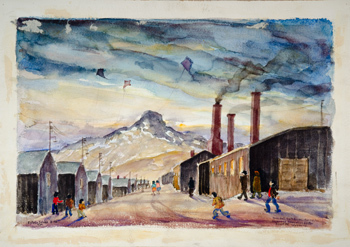 Estelle Peck Ishigo is best known for her watercolors sketches documenting the three long years she spent with her Japanese- American husband, Arthur Ishigo, in the Japanese internment camps during WWII. Ishigo was one of the few white women who volunteered to follow her husband when he was required to deport for the camps. Her story became nationally known in the early 1990’s when filmmaker Steven Okazaki, inspired by Ishigo’s book “Lone Heart Mountain”, made her the subject his Academy Award winning documentary ‘Days of Waiting’. Ishigo was born in Oakland, California in 1899. Her mother was an opera singer and her father was a painter and piano tuner. When Ishigo was about 12 years old her parents would often leave her in the care of one relative or another. These situations were not always happy circumstances for the young Estelle. As soon as she could, Ishigo left to be on her own and would eventually attend and earn a degree from Otis Art Institute in Los Angeles. Ishigo met her husband, Arthur, in 1929 and declared that it was “Love at first sight”. Because at the time it was illegal for a white person to marry someone outside other his or her race the couple decided to travel to Mexico and get married. After the couple’s return, she was disowned by her family because of her marriage. She and her husband would settle down in a local Japanese community. In the aftermath of Pearl Harbor both the Ishigos were discriminately fired from their jobs and Arthur received notice from the MP that he was to report shortly to the Ponoma Assembly Center where he was to wait for relocation to Heart Mountain, Wyoming. Estelle, not wanting to be separated from her husband, packed her belongings and joined him. Immediately, while sitting with several families waiting to board, Ishigo pulled out a pencil and some paper and began sketching. She captured the long waiting, the fear, the feeling of uncertainty and the harshness of this new reality. When the war ended the Ishigos, along with the other camp prisoners, were allowed to return to their home. The couple lived the rest of their lives in poverty because of their experience and the discrimination they faced afterwards. 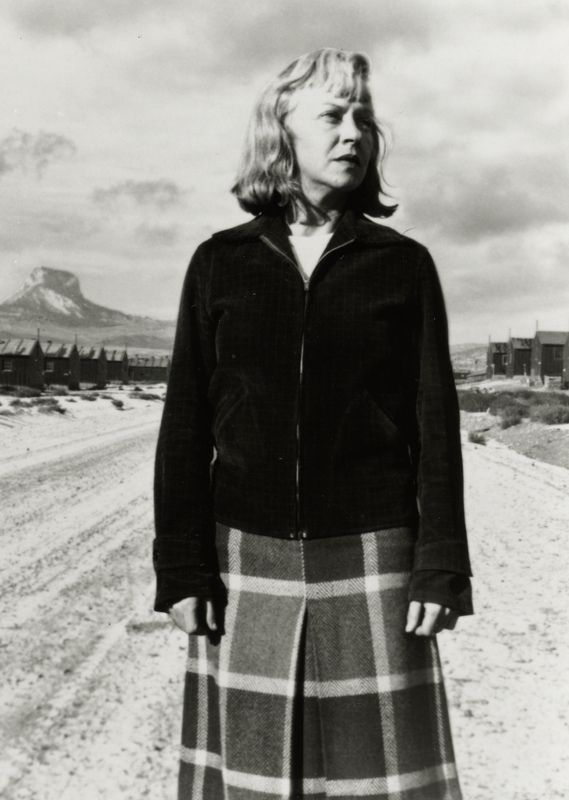 Estelle Peck-Ishigo never painted again. Arthur Ishigo passed away in 1957 and Estelle lived a reclusive life after his death. During the 1970’s a book of Estelle’s paintings was published, it has since gone out of print, and an exhibit of her work was shown in 1972. It was the only time her work was to be publicly exhibited. In 1983 she was found in a basement, by a group of friends from her years in the camp, barely living and immobile. She was transferred with the help of her friends to a hospital where she passed away in 1990 shortly before the completion of Okazaki’s ‘Days of Waiting’, a documentary that focused on her and her work during the war. The first thing I noticed about Ishigo’s paintings was the lack of anger and bitterness in her mark making. Instead I see honest and dignified depictions of the mundane existence and the heavy loneliness that came with camp life. Her interests were obviously not to express personal feelings of what was happening, but to accurately record what she saw. In some part I am sure that her watercolors was a tool to help pass the time away, in another part I believe she was a compassionate woman wanting to bring some color into a dreary predicament. For more information please check the following links. “Days of Waiting” can be ordered via PBS. My Grandmother, a spirited woman of 79 years, just celebrated her birthday this past weekend – sadly I am 1,000 plus miles away. She has always been one of my most supportive fans when it came to my artwork. I remember when I was maybe 13 years old and she asked if I would make a pastel drawing of a lakeshore scene from one of her camping trips for my Uncle as a holiday gift. To this day he still has the pastel drawing hanging in his living room and my grandmother still brags to everyone she meets about the details a that little drawing. For her birthday this year I decided to paint for her a Postcard Sketch of Devils Tower. The first time I visited Devils Tower I was about 4 years old and I had never forgotten it. Running along the winding path near the boulders is one of my earliest most vivid memories. Twenty-four years later I returned to Devils Tower and had the most amazing experience reliving those precious childhood memories. I recognized specific spots along the walking path, in some ways they had not changed at all. I can easily recall running as fast as I could on the path until I had reached this one spot, when the path makes a sharp turn left, it was that place where I thought I would most definitely collide with these large, almost menacing, boulders – from a 4 year olds perspective – because I couldn’t stop running in time. Now those boulders still stand there, but they are not nearly as large, nor are they even remotely menacing. I took the photo that this little watercolor sketch was based on along that memorable path during my revisit.